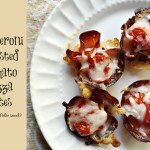 These pepperoni roasted tomato pizza bites are the perfect low carb snack. 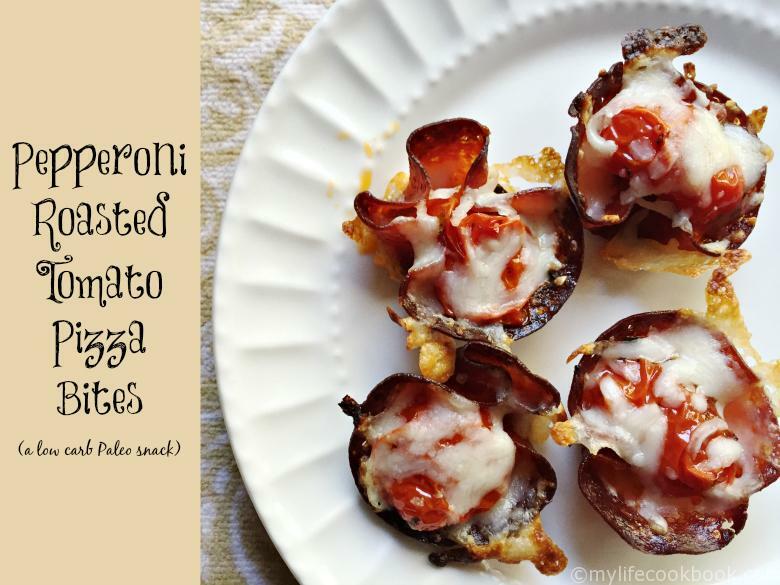 They make for an easy and delicious appetizer too! These are not the prettiest of things but boy are they tasty! Lately I’ve been trying to find more and more low carb snacks and treats. I was really in the mood for some pizza so I tried to think of how I could make a low carb snack that would have the same flavors. I started by sautéing a handful of grape tomatoes in olive oil and pizza spices. They were tasty on their own. Then I thought about making pepperoni cups just like all those bacon cups you see on Pinterest. Add a little cheese and you have Pizza bites. To make the pepperoni cups I used a mini muffin pan. I could have put them in a bigger muffin pan but the size of pepperoni that I had was too little to make a cup. So deepening on the size of the pepperoni, it would determine what size of muffin pan you will use. You bake these until they are crispy but not burnt. I put a little bit of cheese on the bottom of mine because the slices were very thin and I didn’t want anything to leak out. Pictured above you can see what they look like out of the oven. While those are cooking, start sautéing your tomatoes with olive oil, basil, oregano, salt and pepper. Once they get soft and deflated, they are done. Tomatoes like this are so sweet and tasty. If you like sun dried tomatoes you will love these. Next you take a tomato or two and put them in the pepperoni cups. Top them with some shredded mozzarella and put them under the broiler for a few minutes until the cheese is melted. And that is all there is to it. Like I said earlier, they aren’t the prettiest of things but they sure are tasty! Enjoy! Add olive oil, tomatoes and spices to a pan and sauté over medium heat for about 10 minutes or until the tomatoes are soft and brown. Meanwhile add your pepperoni slices to a small muffin tin. Press inside each piece of pepperoni to make a cup. Add a little pinch of cheese on the bottom especially if your pepperoni is thin and there might be holes. Bake for 10 minutes or until browned and crisp. (Oven temps may vary so check around the 10 minutes mark. If it needs longer check it in 2 more minutes). Let pepperoni cool and then add the roasted tomatoes. Top with a pinch of cheese and then set back in the oven and broil for a few minutes or until the cheese melts. The Paleo diet does not include dairy products and I do in many of my recipes. I tend to follow a modified Paleo / Primal /Low Carb diet and use the principles of all three. Dairy is a high protein food group with plenty of nutrition that I feel is valuable in our families’ diet not to mention that it tastes great. Here is an interesting article about full fat dairy products from Mark Sisson who started the whole Primal movement. So if you can not tolerate dairy products or you are a strict Paleo enthusiast, my apologies. Going forward I will be more cautious with how I label my recipes.